Gen. Wesley Clark Weighs Presidential Bid: “I Think About It Every Day” | Democracy Now! retired four-star U.S. Army general, Supreme Allied Commander of NATO during the Kosovo War. AMY GOODMAN: Today, an exclusive hour with General Wesley Clark, the retired four-star general. He was Supreme Allied Commander of NATO during the Kosovo War. He has been awarded the Presidential Medal of Freedom. In 2004, he unsuccessfully ran for the Democratic presidential nomination. He recently edited a series of books about famous U.S. generals, including Dwight Eisenhower and Ulysses Grant, both of whom became president after their military careers ended. AMY GOODMAN: Well, for the rest of the hour, we’ll hear General Wesley Clark in his own words on the possibility of a U.S. attack on Iran; the impeachment of President Bush; the use of cluster bombs; the bombing of Radio Television Serbia during the Kosovo War under his command; and much more. I interviewed General Clark on Tuesday at the 92nd Street Y in New York. 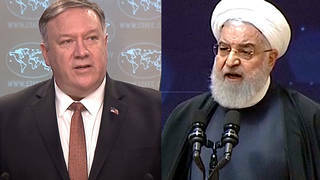 And the administration has stubbornly refused to talk with Iran about their perception, in part because they don’t want to pay the price with their domestic — our U.S. domestic political base, the right-wing base, but also because they don’t want to legitimate a government that they’ve been trying to overthrow. If you were Iran, you’d probably believe that you were mostly already at war with the United States anyway, since we’ve asserted that their government needs regime change, and we’ve asked Congress to appropriate $75 million to do it, and we are supporting terrorist groups, apparently, who are infiltrating and blowing up things inside Iraq — Iran. And if we’re not doing it, let’s put it this way: We’re probably cognizant of it and encouraging it. So it’s not surprising that we’re moving to a point of confrontation and crisis with Iran. AMY GOODMAN: I wanted to get your response to Seymour Hersh’s piece in The New Yorker to two key points this week, reporting the Pentagon’s established a special planning group within the office of the Joint Chiefs of Staff to plan a bombing attack on Iran, that this is coming as the Bush administration and Saudi Arabia are pumping money for covert operations into many areas of the Middle East, including Lebanon, Syria and Iran, in an effort to strengthen Saudi-supported Sunni Islam groups and weaken Iranian-backed Shias — some of the covert money has been given to jihadist groups in Lebanon with ties to al-Qaeda — fighting the Shias by funding with Prince Bandar and then with U.S. money not approved by Congress, funding the Sunnis connected to al-Qaeda. So, you know, in World War I in France, there were a series of terribly misplaced offensives, and they brought — they failed again and again and again. The French took incredible losses. And these were conscript armies. And after one of these failures, a group of thousands of soldiers simply said, “We’re not doing this again. It’s wrong.” You know what the French did? They did what they call decimation. They lined up the troops. They took every 10th soldier, and they shot them. Now, the general who ordered that, he suffered some severe repercussions, personally, morally, but after that the soldiers in France didn’t disobey. Had the army disintegrated at that point, Germany would have occupied France. So when you’re dealing with the use of force, there is an element of compulsion in the Armed Forces. GEN. WESLEY CLARK: Well, you start with a nonbinding resolution in the United States Congress, and you build your momentum from there. And you keep hammering it. The Congress has three principal powers. It has the power to appoint, power to investigate, power to fund. And you go after all three. On all three fronts, you find out what the president needs, until he takes it seriously. I think it’s a difficult maneuver to use a scalpel and say, “Well, we’re going to support funding, but we’re not going to support funding for the surge,” because that’s requiring a degree of micromanagement that Congress can’t do. But you can certainly put enough squeeze on the president that he finally calls in the leaders of the Congress and says, “OK, OK, what’s it going to take? I’ve got to get my White House budget passed. I’ve got to get 30 judges, federal judges, confirmed. I’ve got to get these federal prosecutors — you know, the ones that I caused to resign so I could handle it — they’ve got to get replacements in place. What do I have to do to get some support here?” I mean, it could be done. It’s hard, bare-knuckle government. What we do have to do is have a strategy that uses all the elements of America’s power — diplomatic, economic, legal and military. I would send a high-level diplomatic team into the region right now. I’d have no-holds-barred and no-preconditioned discussion with Iran and Syria. And I would let it be known that I’ve got in my bag all the tricks, including putting another 50,000 troops in Iraq and pulling all 150,000 troops out. And we’re going to reach an agreement on a statement of principles that brings stability and peace and order to the region. So let’s just sit down and start doing it. Now, that could be done with the right administrative leadership. It just hasn’t been done. AMY GOODMAN: General Wesley Clark recently edited a series of books about famous U.S. generals: Grant, LeMay, Patton and Eisenhower. When I interviewed him at the 92nd Street Y, I asked him a question about the presidency of General Dwight Eisenhower. AMY GOODMAN: I wanted to ask you about what you think of the response to Jimmy Carter’s book, Peace, Not Apartheid. But somehow we’ve got to move off top dead center in terms of these discussions with the Palestinians. And this administration has failed to lead. They came into office basically determined not to do anything that Bill Clinton did. I think that was the basic guideline. And so, they have allowed unremitting violence between Israel and the Palestinians with hardly an effort to stop that through U.S. leadership. And now, it’s almost too late. So Condi was over there the other day, and she didn’t achieve what she wanted to achieve, and people want to blame the Saudis. But at least the Saudis tried to do something at Mecca by putting together a unity government. So I fault the administration. AMY GOODMAN: There are more than a hundred journalists and media workers in Iraq who have died. And particularly hard hit are Arab journalists. I mean, you had Tariq Ayoub, the Al Jazeera reporter, who died on the roof of Al Jazeera when the U.S. military shelled Al Jazeera, then went on to shell the Palestine Hotel and killed two reporters, a Reuters cameraman and one from Telecinco in Spain named Jose Couso. Many Arab journalists feel like they have been targeted, the idea of shooting the messenger. But this tough question goes back to your being Supreme Allied Commander in Yugoslavia and the bombing of Radio Television Serbia. Do you regret that that happened, that you did that? GEN. WESLEY CLARK: It was not a civilian target. It was a military target. It was part of the Serb command and control network. GEN. WESLEY CLARK: Well, I think it was investigated by the International Criminal Tribunal in Yugoslavia and found to be a legitimate target. So I think it’s perfectly all right for Amnesty International to have their say, but everything we did was approved by lawyers, and every target was blessed. We would not have committed a war crime. GEN. WESLEY CLARK: Well, it was a tragedy. But I’ll tell you something. If you want to talk about tragedies, how about this one? We bombed what we thought was a Serb police station in Kosovo. We saw the Serb vehicles. We flew unmanned aerial vehicles over it. And we did everything we could to identify it. And we found that there were Serb police vehicles parked there at night, so we sent an F-16 in, dropped two 500-pound laser-guided bombs and took it out. We killed 80 Albanians who had been imprisoned by the Serbs there. They were trying to escape, and the Serbs locked them up in this farmhouse and surrounded them with vehicles. So, I regret every single innocent person who died, and I prayed every night that there wouldn’t be any innocent people who died. But this is why I say you must use force only as a last resort. AMY GOODMAN: Right now, the U.S. has rejected an international call to ban the use of cluster bombs. On Friday, 46 countries were in Oslo to develop a new international treaty to ban the use of cluster munitions by — I think it’s 2008. Would you support that?